The wait is finally over, having owned a Showdown Troller and a Marcum LX-7, the only trouble that I've had with both of these units is the Flimsy ducer arms ! Both arms have a Distinct weakness in the pivot hinge on the ducer arm ! That has been an issue for both of these units since their release and another cheap plastic arm replacement has been the only option ! Thanks to a dedicated fellow ice fishermen/ Master Machinist named John Kinsman, that issue has been resolved ! John has designed and engineered new Transducer arms from 6061 Billet Aluminum for both the Showdown units and the Marcum units ! I have been fortunate enough to work with John on the field research for these arms and they have Proven themselves on the ice ! My prefered style of fishing is running and gunning, locating and staying on the fish is a priority for me and these new Billet arms have made it a lot easier for me ! Moving from hole to hole can and will put undue stress on the ducer arms, packing the ducer away and coiling the cable is an extra step that when trying to stay on a fast moving school of big perch or crappie that just isn't feasable for me ! These new arms are specifically designed to stand up to the weight and swinging motion that is generated every time the unit is lifted out of the hole and moved to another one ! 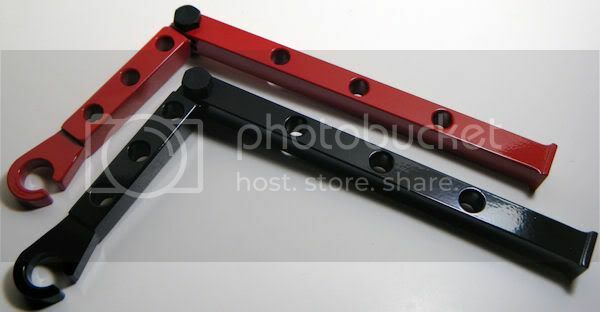 John has designed these new arms to be both light weight and strong and with the choice of either Polished Aluminum or powdercoating in Gloss Blood Red or Gloss Black, they are designed to last the lifetime of your sonar and give it that Custom look that the factory arms just don't have !